Minister of Plantation Industries and Co-Chair of the Permanent Standing Committee on Human Rights in Sri Lanka,Mahinda Samarasinghe, had reportedly said the government will face challenges at the upcoming United Nations Human Rights Council (UNHRC) sessions to be held in Geneva in March. He stressed the government would protect and safeguard the country and the war heroes. The government will also be armed with information gleaned from the census conducted by the Department of Census and Statistics in the Northern Province, he further said. The United States of America is expected to present a resolution against Sri Lanka regarding its alleged violations of human rights at the sessions. 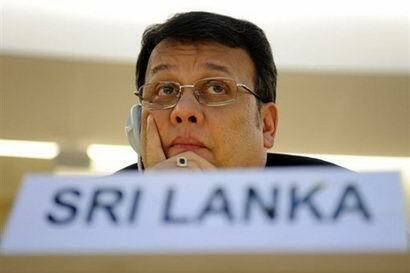 “The general comment I have made is quite self- evident,” Samarasinghe said. Yes, truly we have to respond back to the people who trying to underestimate our mission. In same time we should provide evidence within the Tamil community. Means when goes to the Geneva we should carry the response along with video and other evidence what we have. May be there are evidences that red cross supporting and covering terrorists, or UN providing shelters to terrorists or people who oppose now have other facts where they have faced for deportation after refugee status can not be move forward. Identify all the aspects and face for it promptly will be good for anything rather than just say we don’t take action or we don’t do any investigations.